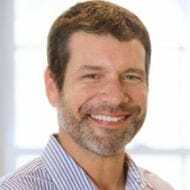 TL; DR: For more than a decade, RightScale has been helping enterprise-level businesses more easily deploy and scale applications through SaaS-based cloud solutions. The company’s Cloud Management Platform provides a centralized console to orchestrate workloads, improve IT efficiency, and accelerate app delivery. With RightScale’s new company-wide cloud cost management tool, Optima, businesses can better coordinate operations and optimize costs by gaining pinpointed visibility into the factors impacting revenue streams. By partnering with RightScale, enterprises are able to devise effective cloud strategies that lower resource overhead and maximize profits. I’ll admit it. I went through a Farmville phase. There was something meditative about cultivating digital crops and reaping electronic harvests that was difficult to resist. I’m not sure how many hours I dedicated to the game, but I do take comfort in knowing I wasn’t alone in the fields. The game’s creator, Zynga, saw the popularity of its application grow from zero to 10 million virtual farmers within just six weeks of its release. With this type of growth, it’s no wonder Zynga’s on-premises resources couldn’t keep up. To maintain pace with this massive scaling, the company needed to move to cloud-based infrastructure. Due to Farmville’s size and the game developer’s other popular games, Zynga soon found itself employing thousands of cloud servers — and the company’s admins quickly realized management was almost an impossible task. That’s when Zynga turned to RightScale. It took just a handful of Zynga admins to manage the enormous server farm thanks to the dynamic automated scaling and configuration flexibility RighScale’s Cloud Management Platform provided. Since 2006, RightScale has been helping businesses, like Zynga, deploy, manage, and scale their applications across clouds, and launch thousands of deployments to more than 2 million servers. The ability to manage multiple platforms simultaneously, married with effective resource optimization, allows businesses to achieve higher revenue as they scale. Through cloud solutions and direct consulting, RightScale nurtures the development of more efficient cloud strategies that ultimately result in positive impacts on bottom lines. As one of the components in the company’s toolbox, RightScale Optima helps administrators optimize costs through collaboration in multiple clouds. Admins employ Optima to coordinate between cloud governance teams and resource owners to define rules and policies, get alerts, review recommendations, and automate processes. Cloud governance teams may suggest policies and recommend automated tasks, while resource owners review and give feedback on these recommendations. According to RightScale, collaboration accounts for roughly 27% of total cost savings initiatives — more than the savings achieved by deploying automated applications and deleting outdated storage volumes and virtual machines. Fortunately, Optima provides a centralized way to import and analyze data from all clouds in use — allowing admins to divide costs by categories such as apps, teams, or cloud accounts. RightScale Optima allows complete visibility into data from all your clouds from a central, unified dashboard. Optima tracks savings progress through the use of scoreboards and includes automation features to target inefficient spends and to take advantage of discounts for Google and AWS. These features reduce costs and help businesses forecast future application spends through budget tracking and trend prediction. Optima identifies underused cloud resources and tailors recommendations based on appropriate usage needs. Instant savings recommendations, noise reduction, and tailored alerts allow for a quick return on investment. RightScale’s Cloud Management Platform arms companies to achieve cost-effective cloud orchestration. From a single console, admins can manage workloads across any cloud or server with a single API. This enables auto-scaling and timely scripting and patching. CMP also offers an in-depth cloud strategy guide along with consultation services to assess cloud maturity and plan for improvement. 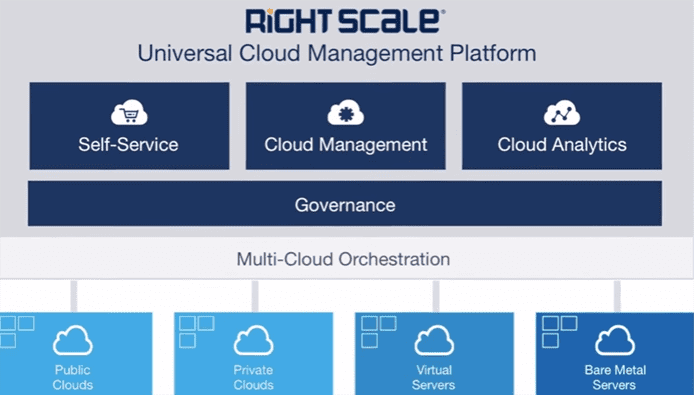 RightScale’s management platform allows the simple orchestration and management of public and private clouds. In addition to simplifying management, a centralized cloud console helps consolidate cost savings because infrastructure will be running at optimal capacity — in terms of both resources and a reduced need to hire additional staff. The result is automatic growth management and faster-growing profits. This type of hybrid cloud management removes obstacles without compromising the level of control. RightScale’s Cloud Management Platform brings together an extensive set of features, including resource discovery, universal tag management, operational scripts, Docker support, templates, and group permissions, among others. The platform can create portable workloads with ServerTemplates, audit resources, and use tags to help organize and automate cloud processes. RightScale’s Cloud Comparison tool empowers enterprises to choose the right clouds to suit their individual needs — enabling them to procure sufficient resources without excess. The tool can set criteria regarding security certificates, operating systems, countries, relational databases, and network and storage services. With more than 50 benchmarks to compare, RightScale ensures enterprises get just what they need, even as they continue to evolve and scale. 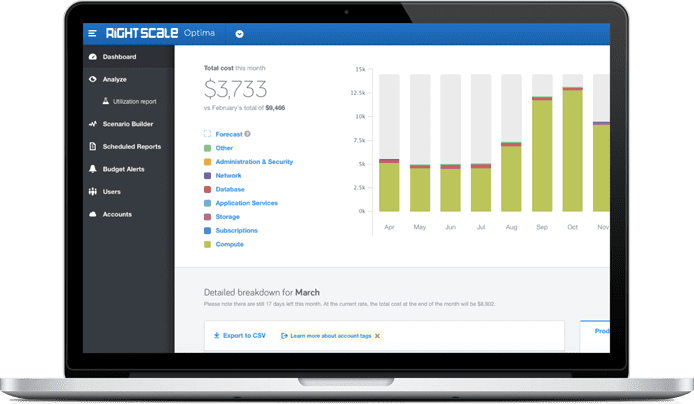 RightScale’s Cloud Comparison tool allows businesses to determine which environments will best help them scale. In addition to more direct management solutions, RightScale supplies multiple cloud strategy resources, including white papers, a downloadable guide, and illustrative videos and webinars. The company’s guides help businesses customize strategies regarding applications and budgets for chosen clouds. An especially useful tool is the downloadable cloud ROI calculator, which helps weigh and predict the financial benefits of the cloud against resource cost by using a data-driven approach. Between the ROI calculator and Cloud Analytics, RightScale helps build top-of-the-line strategies to push businesses forward, driving innovation, boosting efficiency, and opening new revenue streams. I may have laid down my plow and turned off my Farmville tractor, but RightScale shows no signs of slowing its efforts to help enterprises improve efficiencies and bottom lines. For more than 10 years, RightScale has assisted numerous companies in delivering mission-critical applications. Employed by major enterprises, such as Sling, PBS, and Harvard, RightScale manages thousands of clouds across the globe. As a result, the company has been recognized by the industry as a major leader in hybrid cloud management solutions. And, with continuous updates to its products and a mission to evolve alongside customer need, RightScale is sure to maintain its position at the head of the pack.